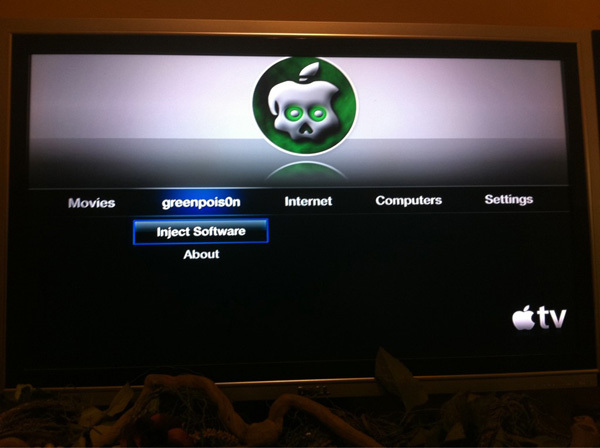 Greenpois0n & Limera1n both are capable of jailbreaking AppleTV 2 running on iOS 4.1 however it is yet to find the real use of this jailbreak since there isn’t any apps like iPhone & iPod Touch for AppleTV 2. Also the Apple TV 2 is just started shipping there isn’t many users looking to jailbreak their AppleTV 2 4.1 iOS & the requirement for jailbreak is MicroUSB cable which doesn’t comes with AppleTV 2. From the screenshot you will notice it has an option to “Inject software” now that’s what the advantage of AppleTV 2 jailbreak is, ability to load third party software on your AppleTV 2. No details on how to jailbreak AppleTV 2 are out, stay tuned with us for more information on AppleTV 2 Jailbreak.